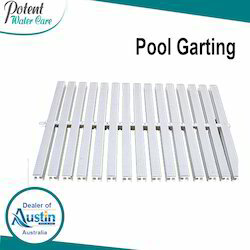 We are supplier & exporter of Swimming Pool Grating. Our Swimming Pool Gratings are used to cover the Overflow channel (Drain) built around the Swimming Pool and ensure that the Swimmers do not fall in the Overflow channel while entering the Swimming Pool. The Pool Gratings have sufficient gap in between them to ensure that the Overflowing Pool Water enters the overflow drain but also ensure that a person’s foot does not get inside it. 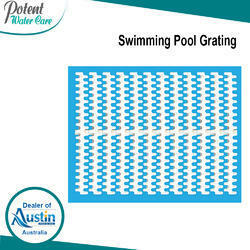 Our Swimming Pool Gratings are made up of Injection Molded Plastic. 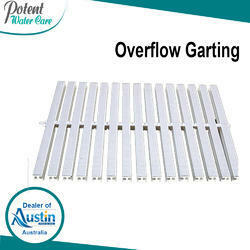 Our Pool Gratings are made up of High-Quality Plastic and are used to cover Overflow Channel. These are tough enough to bear the weight of many people. Comes with a Plug-in design so that one piece can be plugged into another to increase the length. 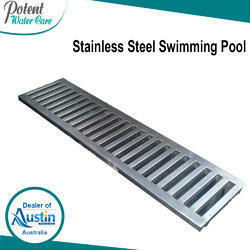 Our Swimming Pool Gratings are also available in Stainless Steel. They are fabricated using SS304 to ensure 100% Rust Proof Material. They do not corrode, fade or break over a long period of usage. Our Overflow gratings are used to cover the Drain along the swimming pools. These are made up of best grade of plastic. The Gratings are easy to install and clean. They have a high load bearing capacity. The Pool Gratings ensure that no one falls into Pool Drain. Also ensures the overflowing water goes into the drain. Our Swimming Pool Gratings which are used to cover the pool’s drain. They are self supporting and bridge over both the edges of the pool drain. They are strong enough for a person to walk over them. Swimming Pool Grating Corners are installed on the corners of the pool overflow channel in place of Swimming pool gratings. 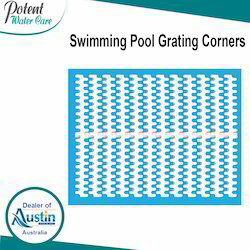 These ensure a better fit and look of pool gratings at the corner. At the corner, the two sides of the swimming pool meet. The orientation of the gratings at the corner does not look proper at the corner. Hence a Swimming Pool grating Corner is installed to ensure a better design. 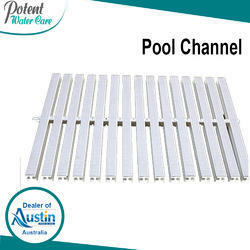 Our Pool Channel are made up of High Quality Plastic and are used to cover Overflow Channel. These are tough enough to bear weight of many people. Comes with a Plug-in design so that one piece can be plugged into another to increase the length. 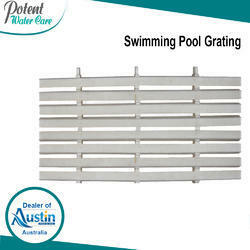 Looking for Swimming Pool Grating ?